This mini website was created by FLT's set-building team to provide access to images of previous sets. To view photographs of a specific set please click on the appropriate link on the left hand side of this page. Visitors are welcome to look around and see what we get up to. All images remain copyright of Formby Little Theatre. To visit Formby Little Theatre's main website please click on the link below. 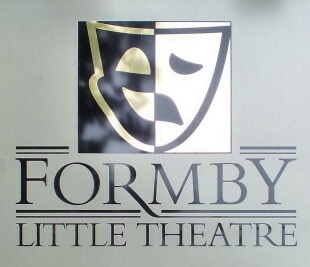 Formby Little Theatre's main website. STANLEY Houghton’s 1912 play was very controversial in its day and still shocks over a hundred years later albeit not in quite the same way. It was one of the first plays to have a working-class female protagonist and deals with the expected position of women in the society of the time. Working-class parents Chris Hawthorn (Peter Collinson) and his wife (Carol Hurst) are anxiously awaiting their daughter’s return from Blackpool. Fanny (Christina Dempsey) eventually breezes in, full of the joys of spring, and realises she’s been rumbled. She has, in fact, been to Llandudno with Allan (Christopher Lanceley), son of local mill owner Nathaniel Jeffcote (David Davies). How did her parents discover her fib when Mary Hollins was supposed to provide a cover story? Shock! Egged on by his wife Hawthorn is sent up to the big house to confront Jeffcote to see ‘what’s to be done’. Between them they agree that Allan must ditch his fiancée, Beatrice (Rachael Armstrong), and marry Fanny. Mrs Jeffcote (Linda Millar) doesn’t agree but, surprisingly, Beatrice considers it to be the correct action and persuades her father, Sir Timothy Farrer (Michael Leathley) that it’s all for the best. Allan doesn’t have any choice in the matter so, having been ditched by Beatrice, reluctantly agrees to marry Fanny. But – does Fanny have other ideas? She is an independent woman. All the comings and goings keep the Maid (Hilda Young) busy as she ushers them in and out of the sitting room. The costumes, the endearing Lancashire accents (ee by gum ... they are good) and the attention to detail make this play very enjoyable and the change in sets from the Hawthorn’s humble cottage to Jeffcote’s big house draws gasps from the audience. Score: 8.5/10 – Well done to director, Val Davies, and her excellent cast.